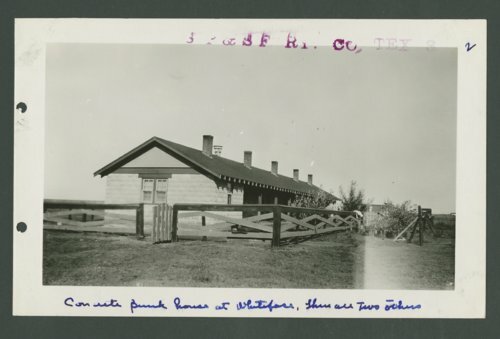 These two photograph show the facilities of the South Plains & Santa Fe Railway Company in Whiteface, Texas. The first image is a view of the concrete bunk house while the second image is a view of the section house. The rail line was a subsidiary of the Atchison, Topeka & Santa Fe Railway company that ran from Lubbock Texas to Bledsoe, Texas.